The weird tale of the blow-out fight between payroll giant ADP and HR software startup Zenefits has gotten even weirder. ADP has slapped Zenefits with a lawsuit, Zenefits CEO Parker Conrad told Business Insider. The suit itself sounds weird, but the even weirder part is that it was proceeded by a threatening phone call from Carlos Rodriguez, the CEO of ADP, Conrad tells us. ADP does not deny the conversation took place, but says it didn't start out hostile. Rodriguez had "made a good faith offer to properly partner" with Zenefits, a spokesperson tells us. The two have been publicly brawling the past couple of days, each accusing the other of all sorts of things. It all began when ADP blocked Zenefits' HR software from accessing ADP's payroll system for "thousands" of their joint customers. ADP accused Zenefits of grabbing inappropriate amounts of data from ADPs systems and violating customers' security. It said that's why it blocked Zenefits. Zenefits called that explanation baloney. Zenefits said it was accessing ADP exactly the way thousands of bookkeepers and other agents access the system and not doing anything untoward. It emailed its customers, put up a blog post, and started a Change.org petition, telling its side of the story. The email, which Business Insider has seen, asked joint customers to tell ADP to stop blocking Zenefits and offered to pay people to ditch ADP: "If you’re interested in switching from ADP payroll to Intuit Payroll, we’re paying customers $1,000 and helping them to make the switch." In the email, Zenefits also said that ADP was really blocking Zenefits because of competitive gamesmanship, because ADP was working on a competitive product and was trying scare people into thinking Zenefits was a security threat. Now ADP has sued, claiming that Zenefits' story about a competing product had "no factual basis," according to a blog post by Zenefits that quotes the lawsuit. It's weird enough for one company to sue another over competitive posturing, but the story gets even weirder. A "confused" sales rep? Or a new competitive product? 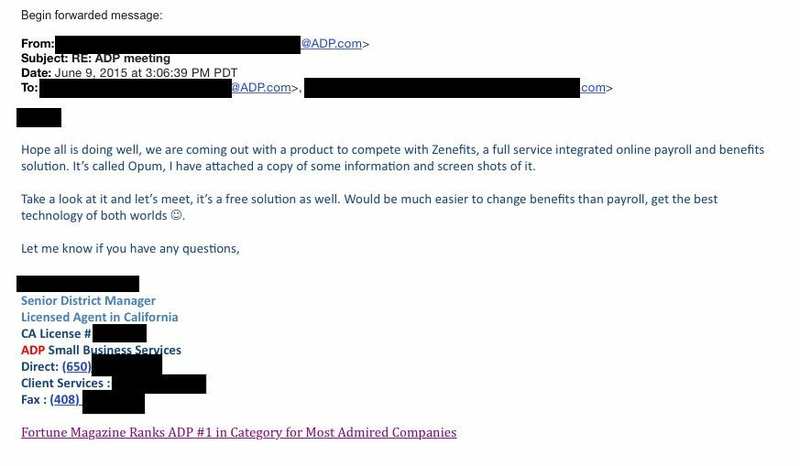 An hour after the lawsuit was filed, an ADP rep contacted at least one shared customer with an email that said, straight out, "We are coming out with a service that competes with Zenefits." ADP says the email was sent by a "confused" sales rep, and that the product in question is not actually new. Here's a copy of the email, which Zenefits forwarded to us. This is exactly what Zenefits said ADP was doing. But ADP CEO Carlos Rodriguez denied it to Zenefits cofounder Parker Conrad in their phone call, according to Conrad. "He was extremely upset that I had said to customers that we thought they were developing a competing product," Conrad told us. With respect to “Opum,” in responding to a direct client inquiry, the sales associate confused the name with Optum Insight, which is a third party platform from United Health Group that we have integrated into our current offering and improves our ability to support benefits enrollment for our clients. This is a core service ADP has offered clients for many years, and is a service that we charge for. We are constantly improving upon these services, some of which overlap with Zenefits’ offerings. Conrad says he was blown away by all of this because, prior to the blow-up last week, he thought Zenefits and ADP had a good relationship. They had a joint marketing agreement and "we sold a lot of payroll for them, and thought we were a good partnership," he says. Zenefits even had an ADP salesperson working out of Zenefits headquarters "to convince Zenefits customers to use ADP." As for the competing product, Conrad says he isn't worried. Its primary focus is to do insurance enrollment, he believes. Zenefits makes its money on things like insurance enrollment, like an insurance broker. It gives its HR software away for free. The free software has turned Zenefits into one of the fastest-growing startups in Valley history. It expects reach $100 million in annually recurring revenue by January 2016, and it just raised $500 million on a $4.5 billion valuation. That new business model is really turning the human resources software industry on its head. Zenefits is to the HR industry what Uber is to the taxi world. Meanwhile, Conrad says, "Most of these other payroll systems are thrilled to work with us. Intuit is incredibly excited." So Zenefits' offer to shift ADP customers to Intuit is standing for now, and "we’ll handle all of it." Here is ADP's full statement of what happened. Late in the day on June 5, Zenefits approached ADP to resolve the security and technical issues that required ADP to block Zenefits from the ADP RUN platform. Despite being offered an immediate opportunity to speak with our CEO to discuss a resolution, Zenefits instead chose to launch a very public campaign (change.org petition and direct emails to clients) to defame ADP, calling into question our motives and our integrity. In their communication to our shared clients, Zenefits simultaneously offered to pay ADP clients to switch their payroll to another vendor. ADP took these erroneous and harmful comments very seriously and demanded that Zenefits immediately and publicly retract those accusations, which were gaining momentum in social media, creating concern among our mutual clients, and creating harm to our reputation. Zenefits CEO Conrad Parker contacted ADP CEO Carlos Rodriguez by email (email below) and by voicemail on Friday, June 5 admitting that Zenefits “may have reacted too quickly” and apologized for their actions, while seeking to engage ADP directly in discussions to fix the issues. On Saturday, Mr. Parker spoke with Mr. Rodriguez by phone. During that conversation ADP’s position remained the same, and Mr. Rodriguez again requested that Zenefits immediately retract their comments, and made a good faith offer to properly partner. Mr. Parker would not comply, forcing ADP to tell its side of the story to our customers and the markets we serve. It was not until Monday evening, and following another request to retract prior statements, that ADP went public with its response. Sorry about this. I'm a bit new to all of this as you may have heard, and perhaps reacted a bit too quickly when we heard we were getting shut down. I asked the team to take a really aggressive stance. If this is a misunderstanding and we moved too quickly on this, gosh I feel terrible about that. [Investor] tells me he just gave you a call, and said he knows you well from his time as a board member at [REDACTED]. Not sure if it's too late for this, but if it were possible for something good to come of this: We've always viewed ADP as a really important potential partner for Zenefits, and if you were open to it, I'd sure like the chance to meet with you personally & tell you a bit about what we do. We are nowhere near ADP's scale of course, but we send out a fair amount of payroll business -- we set up ~ 50 companies with new payroll every week (always to 3rd-parties like ADP, paychex, intuit -- we don't do payroll ourselves). We'd sure like to find a way to send a good chunk of that business to ADP and move forward from this whole thing on a more positive note. I can meet you this week or next at your offices in New Jersey, if that works for you.